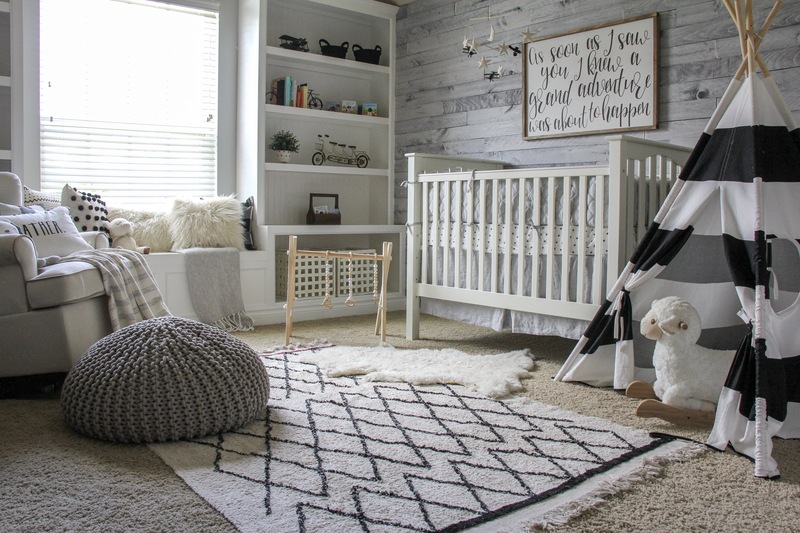 I am finally sharing baby boys nursery! 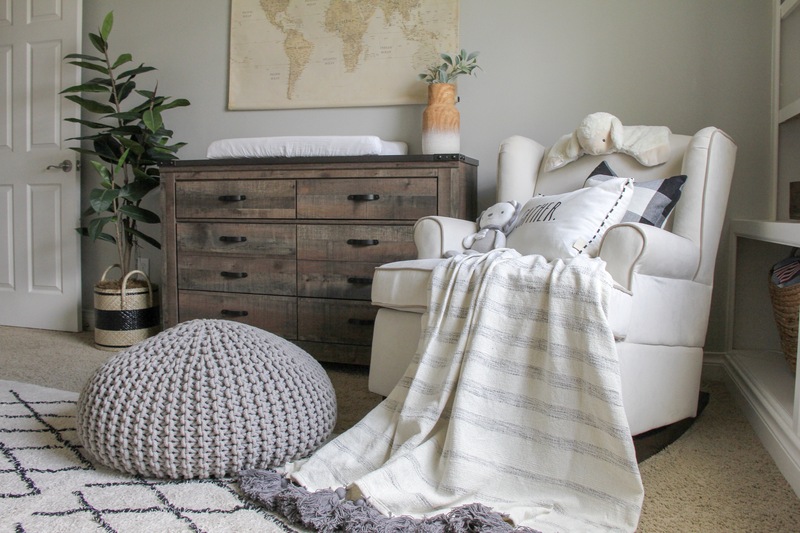 I feel like we have been working on this room forever, basically since we found out we were expecting! 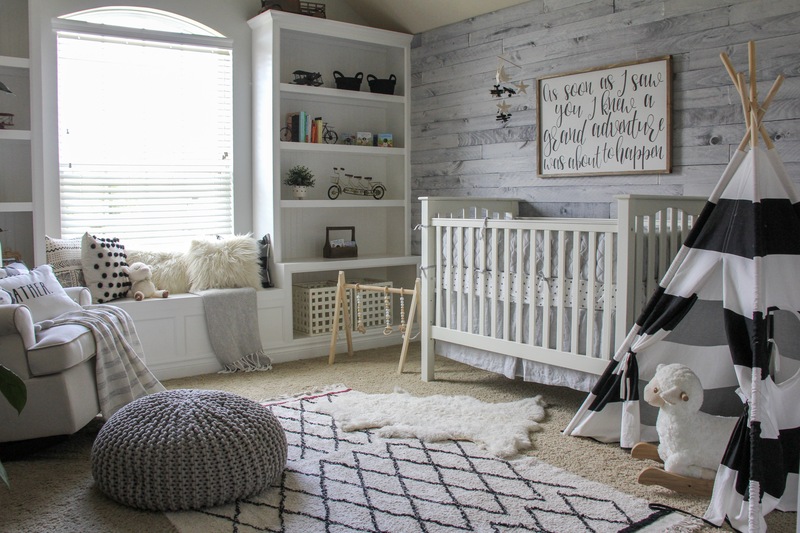 Since I have two girls, creating a boys nursery was a first for me. It was so much fun to shop for things that were not PINK! 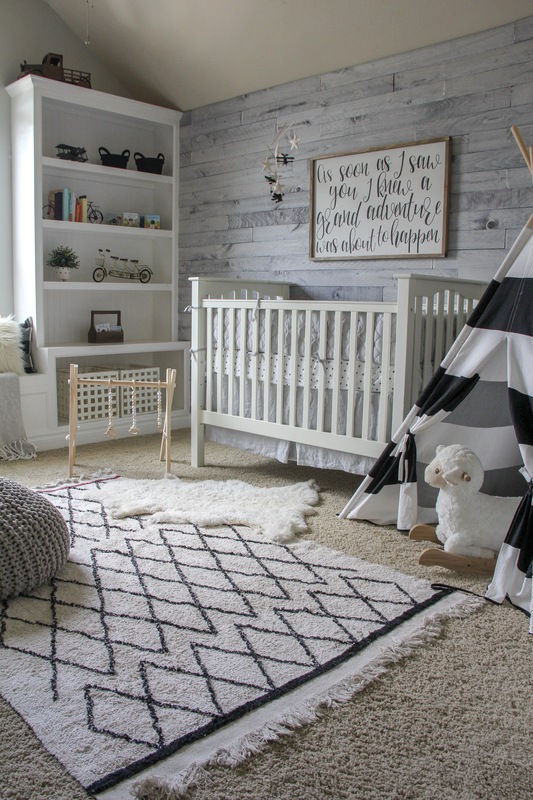 I knew I wanted his nursery to be neutral, so he can grow into it. My theme for this space was modern farmhouse adventure (if that makes any sense???). 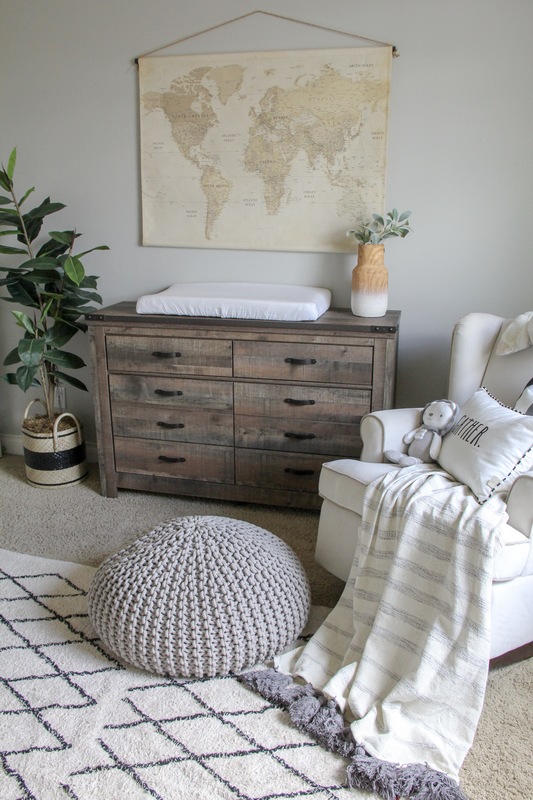 When I first started designing his room I envisioned a vintage travel theme, but as I began to shop I leaned more towards modern decor which is so different from the rest of my house. 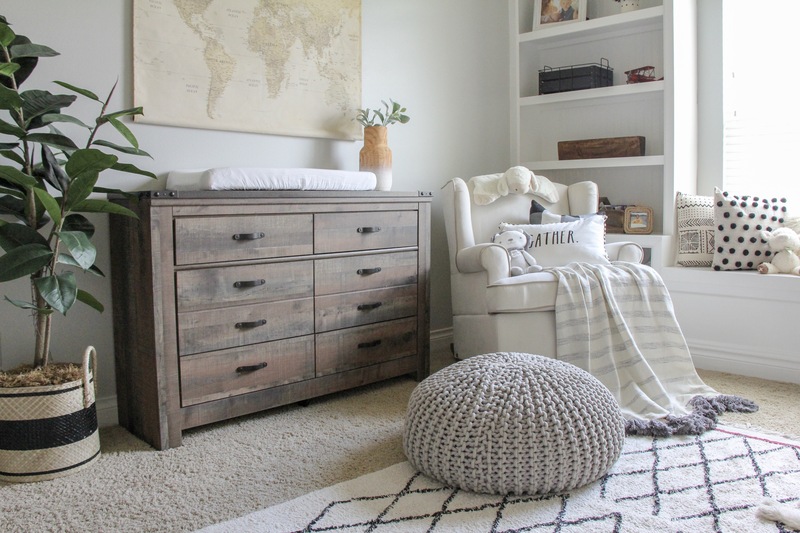 I tried to incorporate a bit of rustic and modern decor throughout his room. My favorite part of his room is the wall boards made by Weaber Lumber. These wallboards were so easy to put up and completely transformed his room. I love the texture and natural elements it provides in this space. The mobile was a bit of a DIY. I had the original star and moon mobile from my daughter, but added the little airplanes. I found a pack of small airplanes from amazon and spray painted them black. Then tied them on! This rocking chair has been with us since my oldest daughter Annabel was born. 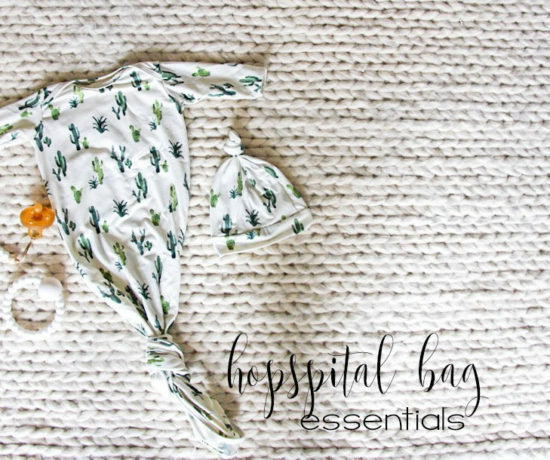 I love that it fits into any decor and it is super comfortable! Another favorite of mine in this room is the sign hanging about his crib. We had this sign custom made from Bear Rug Studio on etsy. They were super easy to work with and I adore how it turned out! The bookcases were custom built by my very handy hubby. I knew I wanted a bookcase with a little reading bench beneath the window. We needed the extra storage and this room was designed perfectly for it. 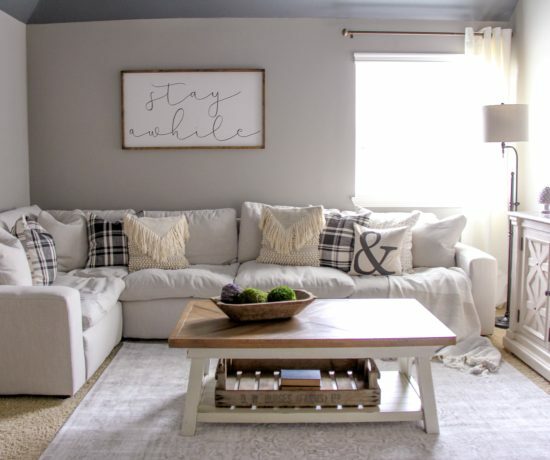 Paint color: Benjamin Moore Simply White. I can not forget about the super cozy rug from Lorena Canal Rugs. The rug is not only so comfortable to walk on but it is also machine washable! 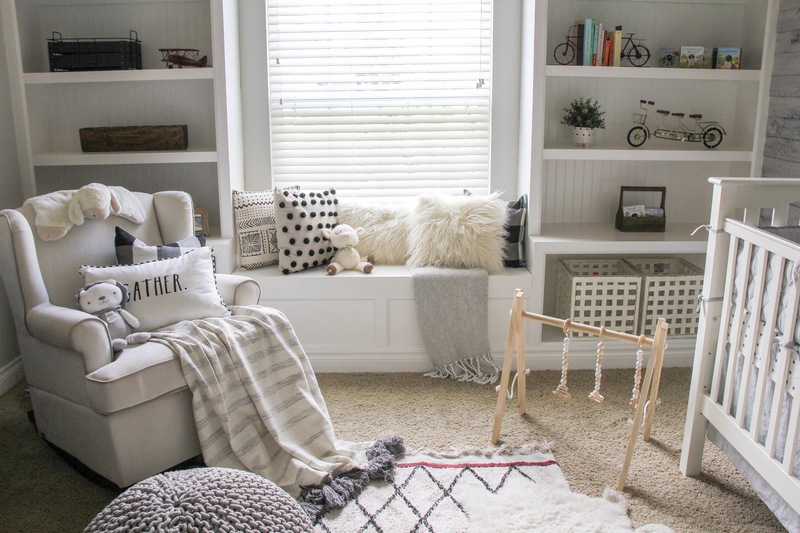 Could that be any more perfect for a kids space??? Even though I didn’t add as much travel decor as I had originally planned, I did still add a few pieces. The map above the dresser is the perfect touch. My favorite gift that I received from my baby shower is this little baby activity gym. I love that it fits in with my decor! I can put it anywhere in my house and it will blend in. I may be a bit more OCD then most people but all the baby gear in bright colors drives me crazy! It was so nice to find an affordable version to display in his room. I am so pleased with how everything turned out. I know i’ll be adding a few more things before he arrives but it is now ready for his arrival. We are just waiting on you baby boy! 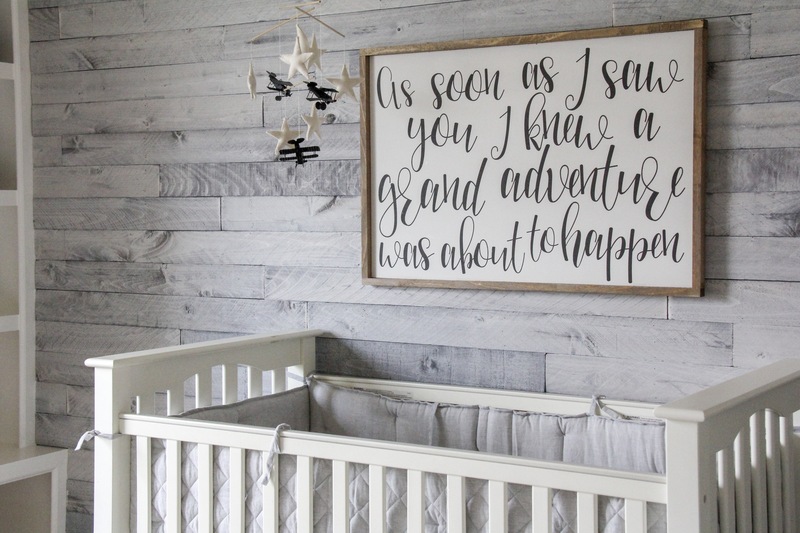 You can shop his nursery by following any of these links below!